Handgun hunting is a small part of the overall hunting market, and those of us who use muzzleloading pistols to bag our deer, hogs and other game are a tiny minority of hunters. Often, there has been only one company offering such a muzzleloading handgun designed for hunters in any given year, but 2012 is a banner year. Both CVA and Traditions now have deer hunting handguns in the marketplace. No doubt about it. These are large guns and they need to be to burn sufficient amounts of black power (or substitutes) to propel .45-caliber saboted bullets or .50-caliber bore diameter bullets into game like whitetail deer, wild hogs and even some African species. Although I have had the Optima out hunting, I have not been lucky enough to have any game before the gun yet, but wanted to write this entry because of the large amount of interest in these guns and how they compare with each other. In looks, the Vortex is the sexier gun, but appearances do not kill much game. 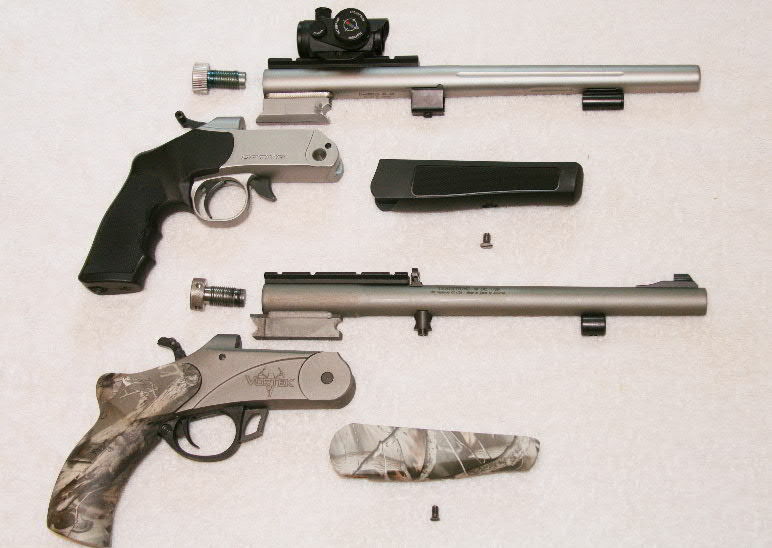 The Optima with its inch-longer barrel is the heavier gun by a 1/4-pound and slightly longer. Both have relieved muzzles for easy loading, both have rails for mounting Red Dot or optical sights and both employ a push button in front of the trigger guard to break the falling-barrel action. The Vortek also has a detachable trigger assembly for easier cleaning. Traditions recommends an 80 grain maximum charge of black powder in the Vortek, whereas CVA says that their Optima will do fine with 100-grain charges. 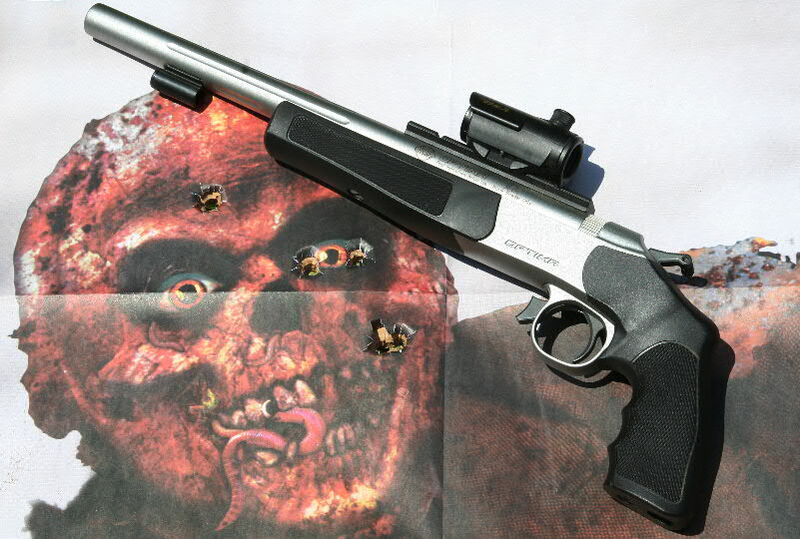 I have had considerable experience taking game with a Thompson/Center Arms 209X.50 muzzleloading Encore with a 15-inch barrel and usually use two Pyrodex or Triple Seven pellets, a Wonder Wad and a 370-grain T/C MaxiBall in this gun. This load can be depended on to penetrate 28-inches of tough deer, hog or wildebeest. For the first shooting test with the new guns, I used 70 grains of Hodgdon’s Triple Seven in the Vortek, a 250 grain Traditions saboted bullet, 290 grain PowerBelt and Kaido Ojamaa’s 255 grain .45-caliber cast lead bullet in a Harvester black ribbed sabot. In the Optima I shot the same three bullets with two of Hodgdon’s White Hot pellets (100 grain black-powder equivalent) and did one shot with 70 grains of Triple Seven and Traditions’ saboted bullet to see what difference that extra inch of barrel made. To give some nearly real-time results to those who were really interested, I posted two YouTube videos. The first “Test Fire CVA’s Optima and Traditions’ Vortek Pistols is up at: http://youtu.be/dTnG1x-orSk , and the second, “Load Development Optima and Vortek Pistols” can be seen at: http://youtu.be/-6o2rF0GN-g.
Vortek 70 gr. T-7 295 gr. Power Belt 1131 fps. 838 ft./lbs. 70 gr. T-7 255 gr. Ojamaa 1265 fps 906 ft./lbs. Optima 70 gr. T-7 250 gr. Traditions 1268 fps. 893 ft./lbs. 100 gr. WH 295 gr. PowerBelt 1370 fps. 1230 ft./lbs. 100 gr. WH 255 gr. Ojamaa 1477 fps. 1235 ft./lbs. Boneyard Bill and the Optima Pistol following 50-yard shooting. The PowerBelt bullet struck the nose and the others left and right in a 2-inch group. The Vortek’s single shot with iron sights was about 4-inches to the right. Not unexpectedly, the longer barrel and heavier powder charges resulted in the Optima developing higher velocities and energies. By this time I was shooting iron sights on the Vortek (with a front bead, which is not good for precision shooting) and a small BSA red-dot sight on the Optima. The Optima certainly shot with game-killing accuracy and had indications of being a very accurate gun – judging from the limited shooting that I did. I fired three shots using the three bullets at Boneyard Bill, my Zombie target, at 50 yards. These three different bullets made a nice triangular 2-inch group, which was probably about the limit of aiming precision with the red-dot scope. A shot with the iron-sighted Vortex hit 4-inches to the right, but would have still been in the “kill area” of a deer. The Optima is the lower cost and the more versatile of the two pistols in that it can take larger loads of cleaner-burning powder, generates higher energy figures and has a better trigger. The Optima pistol from Cabela’s has a base price of about $280, and it is shipped with a synthetic stock and a scope rail, but not with sights. With is wooden stock and iron sights the Vortek is priced at $370. If I owned a Vortek, would I trade it in on an Optima? Probably not. 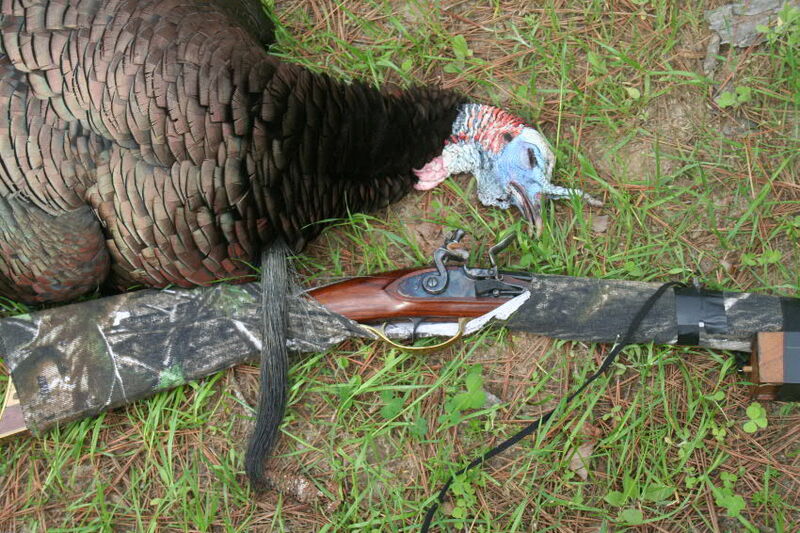 Both pistols will kill close-range deer and hogs very well. To prevent potential wrist damage with these heavy recoiling handguns, I shoot them sparingly. More detailed shooting might change the chronograph results 100 fps. or so, but no deer is likely to know the difference. I will be hunting with the Optima during the 2012-13 season, and it will be interesting to see how it does on game. To date, there is every reason to suspect that this gun will be an outstanding performer. For information on Kaido Ojamaa’s bullets and molds in .36 and .44 calibers contact him at kaido93@hotmail.com. 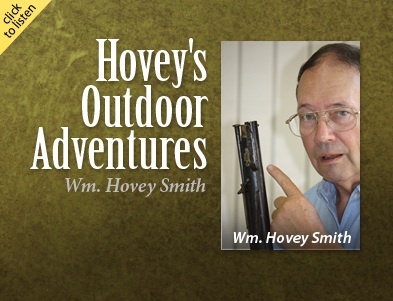 Sixty episodes of the prize-winning WebTalkRadio.net podcast of Hovey’s Outdoor Adventures were produced by one guy during 2011-12. That guy is me, Wm. Hovey Smith. Kickstarter funding is being solicited to replace XP and Vista computers, install a telephone-recording system, get better video stuff for my supporting YouTube videos and move me out of the kitchen. To donate go to the Kickstarter site at: http://kck.st/Jkoyt4. Geographic areas where last year’s shows were recorded ranged from the Outer Banks of North Carolina, to Butler Island on the Georgia coast, to Las Vegas, Nevada, to Kellogg, Idaho, and points in between. 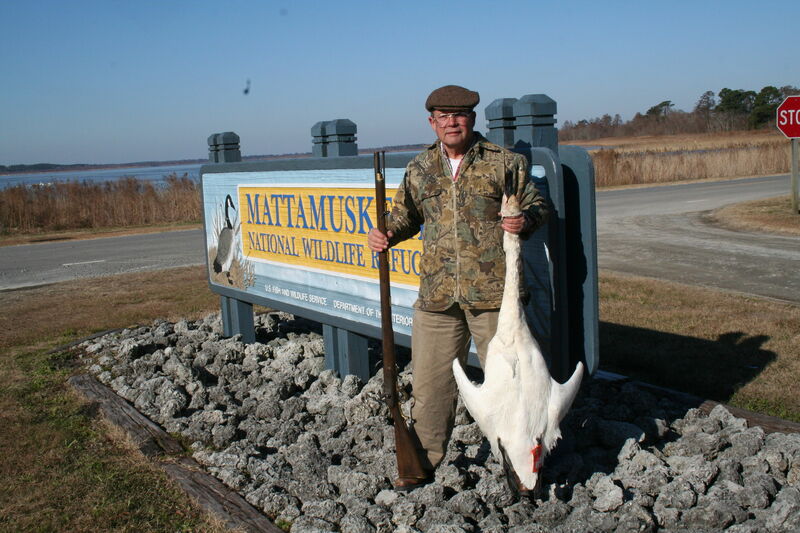 A boost to small-town America is given in my occasional Hunt Destination series where I feature locations like Seward, Nebraska, and Currituck, North Carolina, to give them a bit of an economic lift with radio and video coverage. Show topics have been as varied as the locations. Items covered included not only hunting deer, bear, elk, alligator, turkey, geese, swan, squirrel and snipe; but also environmental restoration of the Gulf Coast, how to start an outdoor-based business, holistic health and human relations – all done with a touch of humor. Diversity is also exhibited in the shows’ formats. Trade show coverage sometimes featured as many as 20 exhibitors, while on other occasions I have carried the hour-long show by myself, as when I described my home town of Sandersville, Georgia. On other occasions, I have employed a bit of old-time radio drama complete with the sounds effects of a back-alley bar at closing time. The thrusts of my outdoor books, radio shows, blogs and videos is to provide factual and entertaining information about the outdoors that a person can use to provide for himself and his family. This is not about me killing so big a such-and-such animal, but is more likely how to drag a road-killed deer home and make meals from it for yourself and your pets as inexpensively as possible. Because this is the equipment that I mostly use, write about and know; muzzleloading guns of all sorts, crossbows, axes and knives often figure in my stories and sometimes unexpectedly appear even in the cooking sections. This makes for interesting radio and videos as well as providing tangible links to past times and recent history. 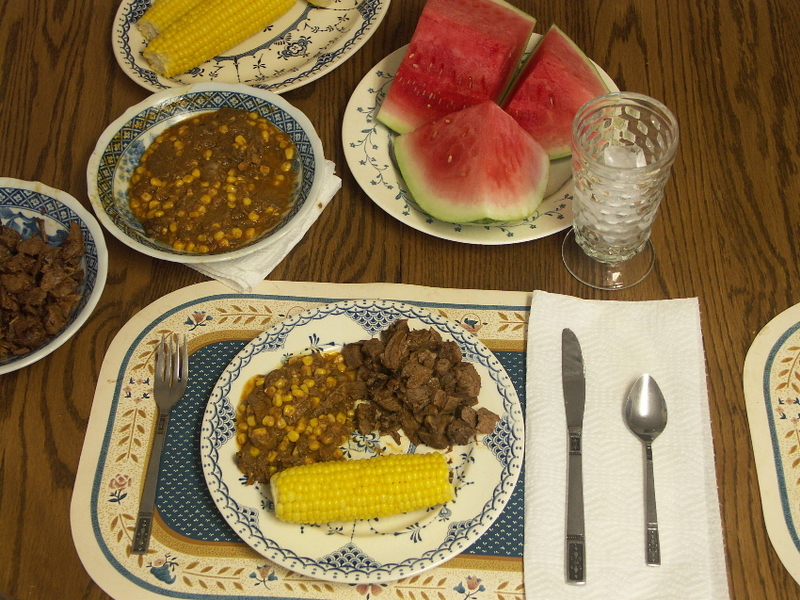 Cooking and eating wild game has always been a part of my life, and I purchase almost no store-bought meats. 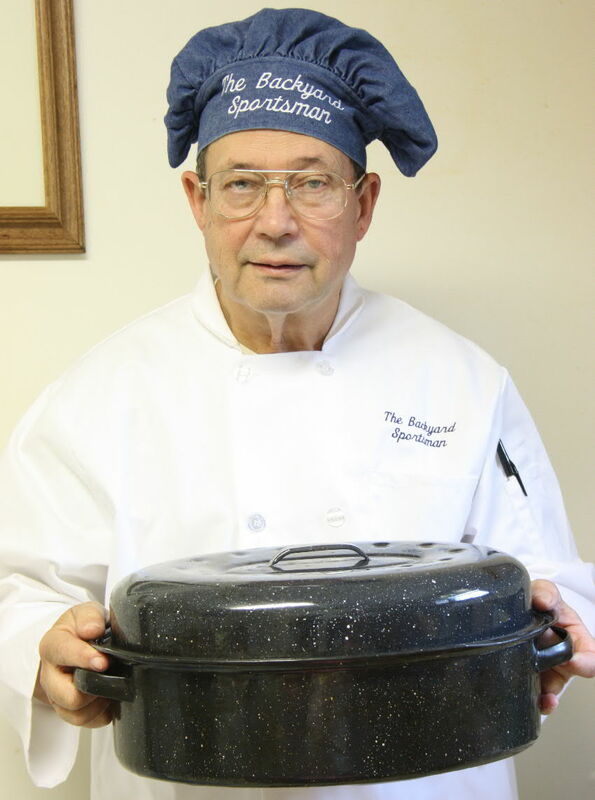 I have adapted and developed many wild game recipes that are often featured on my radio show and YouTube videos. Perhaps the most outlandish of these was Bear Paw Pumpkin Soup for Halloween. This recipe was not all that tasty, but was interesting to cook – maybe with a touch of nutmeg? The concept of making a living from an outdoor-related business was investigated during one radio show and followed up with 21 YouTube videos on the wmhoveysmithchannel which, step-by-step, takes a person through the process from deciding on what business for him/her to do, how to go about it and even what to do with a business after you die. A general overview was provided in a fun bit on a radio show where Professore Logi “Bubba” Pisquale return home to Podunkville, U.S.A., from the University of Padua in Italy, and spoke at a gathering of locals at the Road Kill Cafe where a deer freshly asphalt-aged from nearby Interstate 20 provided the meal. One of the introductory videos may be seen at: http://youtu.be/07MGL8uQfR4. My creative ability to produce ground-breaking radio is still going strong, but I do need some updated hardware and a move out of the kitchen to continue in an effective manner. To see the video associated with the Kickstarter project go to: http://youtu.be/eJIxs6s2tP4. To donate go to my Kickstarter site at:http://kck.st/Jkoyt4.